An art collective is set to open their studio and workshop doors as part of an annual art trail. Featuring 29 studios, including four new artists from the group’s inaugural emerging artists scheme, the trail takes in the studios of 33 professional artists and craftspeople. Visitors will be able to see artists at work, browse their collections and purchase work direct from the studios. From photography and book binding to textiles, paintings, prints, sculptures and rag rug making, there will be a range of art forms on offer. Chairman of Harleston & Waveney Art Trial, Malcolm Cudmore, said: “This year’s Art Trail promises to be a special one, with three new members, one returning member and a showcase of four new emerging artists. “This year, book binding, photography and rag-rug making have been added to the wide range of art techniques within the membership. There will certainly be something to satisfy every taste and pocket - from the contemporary to the traditional, from the abstract to the realist and in both two and three dimensions. Earlier this year the group launched their emerging artists scheme in an effort to showcase the work of up and coming artists with links to the area. The scheme aims to provide a space on the trail for new artists at the beginning of their creative journey and the four selected artists will exhibit together at Holbrook House in Alburgh. Organiser of the emerging artists scheme, Hatty Leith, said: “As the youngest member of the Harleston & Waveney Art Trail, and one very lucky to have grown up with artists as parents, I felt I wanted to do something to help other young artists in the area and to encourage them to show their work, gain confidence and to take advantage of the wealth of knowledge and experience the art trail members have as a whole. “The opportunity arose to make this idea a reality thanks to the support and enthusiasm of our Chairman, and also my parents- Jayne Wurr and Bazil Leith, both members of HWAT themselves- who very generously have donated their studio as an exhibition space for the emerging artists this year. “The four artists selected are at various early stages in their art careers, yet their work truly speaks for itself. Visitors can expect to see some unique wildlife illustrations, textural mixed media collages, dynamic abstract paintings and incredibly refined handwoven textiles. Emerging artist Carolyn Moulton said: “I’m really looking forward to taking part in the first Emerging Artists HWAT initiative and it is a great opportunity for me. This year’s trail also welcomes a guest studio for the first time – Millhouse Pottery, based in Harleston. 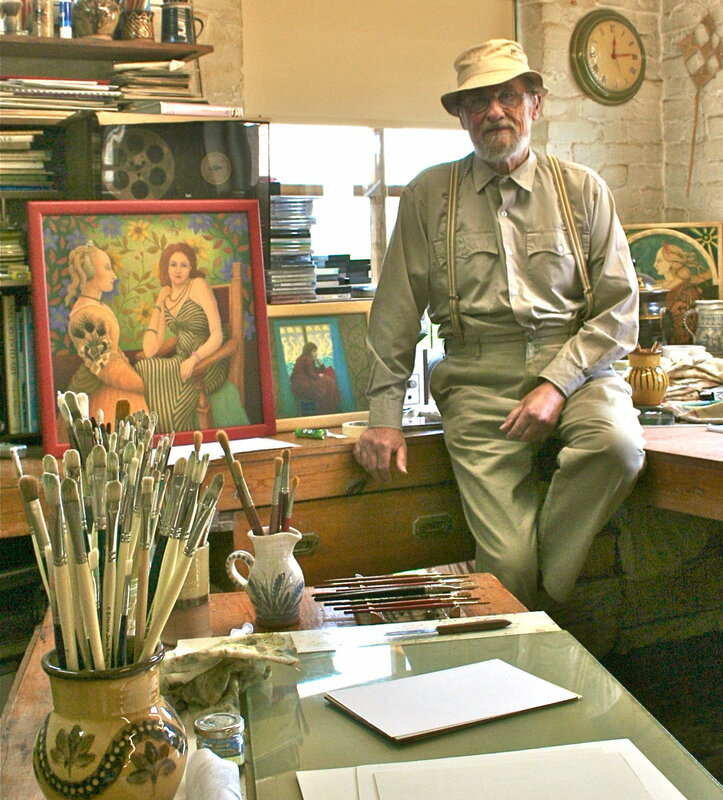 The studio will celebrate the remarkable career of Alan Frewin, who died in 2016, with fine slip-decorated pottery, ceramic paintings, semi-relief plaques and oil paintings. When Alan died he left a range of unfinished works which have been lovingly finished by his son Paul Frewin. Paul, although not a full-time potter, grew up in the studio with his father and was very familiar with his methods and ways of working. The functional items, including jugs, ewers and large platters are decorated with coloured slips and show Paul's exceptional understanding of his father's glazes. Ahead of the group’s art trail there will be three showcase exhibitions where visitors can view the work of participating artists. All of the exhibitions will give visitors the chance to see the quality and breadth of work that will form Harleston & Waveney Art Trail. The first will take place at Norwich Theatre Royal from March 19 – May 20. The second will be at the Fisher Theatre in Bungay from April 21 until May 16. The third is hosted by the Farmer’s Kitchen in Alburgh, south Norfolk for the entire month of May. The Harleston & Waveney Art Trail itself takes place across two weekends - May 18-19 and 25-27 - from 11am – 6pm each day. On the eve of the trail, May 17, a number of textile artists from the group will be hosting a have-a-go day, details of which can be found on Harleston & Waveney Art Trail’s website. The group’s distinctive orange brochure will be widely available from outlets across the Waveney Valley from late March.